You are here: Home / Self Help Daily / Daily Quote / So, How Do You Look at Problems? In addition to one of my favorite photo opportunities (love it when my food’s in good spirits), you’re looking at one of my favorite quotes of all time. Easiest way to set yourself up for a mad case of the blues? 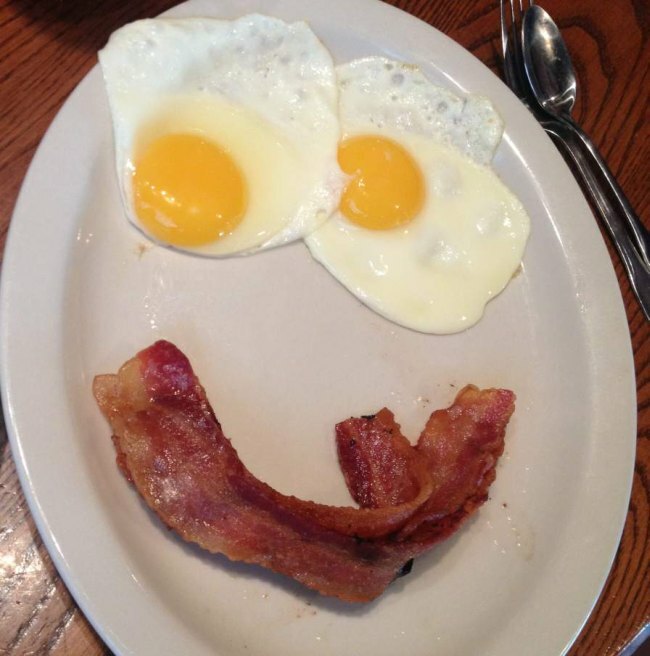 Expect life to always be in as good a mood as my bacon and eggs were. People who are completely thrown off their axis by traffic, bad drivers, long lines, and high grocery prices kind of amuse me. Seriously, man. That’s life. I’m not sure why we seem to think we should be immune to any sort of inconveniences, but it seems to me that people’s fuses are getting shorter and shorter. I have absolutely no idea what we could contribute this to. Some people say it’s because people aren’t “conditioned” to be patient any longer. I guess you could make a case for this theory – we are kind of a drive thru and microwave society, aren’t we? Give it to me NOW! I have no intention of waiting or being inconvenienced! The sooner we realize that life doesn’t OWE us anything, whether it’s a carefree day or a new dining room table, the sooner we’ll be at peace. EXPECT problems… because they are going to come, but instead of letting them eat away at you, plate them and eat them before they even see the fork coming. Previous Post: « Inspirational Quote of the Day: Don’t Take it Personally!